St. Patrick's Day is a fun-filled weekend on the Outer Banks. Visit us in Corolla for St. Patrick's day and enjoy the Running of the Leprechauns Race, great food, green beer, and the largest St. Patrick's Day Parade in North Carolina! What's So Special About Corolla? There are so many special things about Corolla. From the history, to the kind people, to the fantastic beaches - read our take on why we love Corolla! 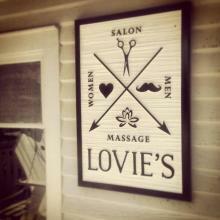 Just Loved Lovie's Day Spa in Corolla! Get to know Historic Corolla Village with a day of pampering at Lovie's, and a visit to the area shops and restaurants. Outer Banks Day Trips from Corolla! Fish On with Corolla Bait & Tackle! 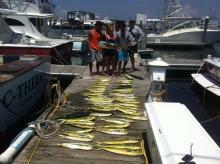 Corolla Bait & Tackle has been providing great fishing products and services in the Corolla area since 2004. Stop by for bait, rod repair, fishing products, charters, or pontoon cruises on your next Corolla vacation! A list of our favorite water sports to enjoy while you're in Corolla! Parasailing, surfing, wave runners, stand-up paddle boarding, and kayaking - rent the equipment, or sign up for a lesson or tour! Advice from our loyal guests about renting a home in Corolla, NC. Book a year in advance for the best selection, go oceanfront, research the floorplan and bedding layout, and use our property maps! 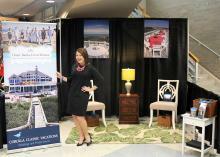 Last weekend was the annual OBX Wedding Expo where vendors from all over the beach come together to showcase what they have to offer to brides who choose to hold their special day on the Outer Banks. It's a super fun event and an absolute MUST for any bride who is even considering her wedding here. We had an amazing turn out for our 2013 Photo Contest with roughly 800 entries! I can’t even tell you how many pictures that I LOVED! It was great to see what others were doing on their Northern Outer Banks beach vacation. It made me forget that I was stuck in the office while you all were having a blast on your family vacations! Thank you for that! There are a lot of things that make visiting Corolla unique and perhaps the biggest is the chance to see horses roaming in their natural habitat.